Artichoke dip is a family favorite – and makes just about any gathering a little more enjoyable. But – that doesn’t mean we can’t shake it up a little bit. Check out the recipe below if you’re looking for a new to dip to try, whether you’re the host or the guest! Drop in asparagus to cook for 2 min, or until crisp-tender. Remove from water and let cool. Bring a medium saucepan to medium heat and melt butter. Add your leaks and cook for 10 minutes or until soft, stirring often. As you’re whisking, let saucepan come to a simmer and cook until thickened. Remove from heat. Add in cheese, and whisk until it is melted and the mixture is smooth. Use salt and pepper to season to taste. Remove and set aside tips of asparagus. Fold in the asparagus stems, artichoke hearts, peas, chives, mint, flat-leaf parsley, zest and 2 ounces crumbled fresh goat cheese. 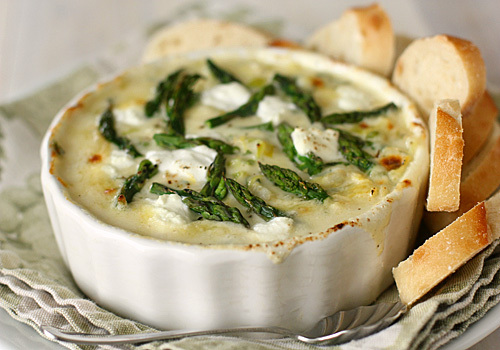 Transfer to a 4-5-cup baking dish, and scatter asparagus tips and remaining goat cheese on top. Bake for 15-20 minutes. The final product should be golden brown and bubbling.